Yanaka Cemetery is one of the highlights of a visit to Yanaka, and by far the most beautiful and interesting cemetery to visit in Tokyo. It is one of the most magnificent graveyards in Japan and is comparable in size to the major parks/gardens in Tokyo. Check out my full article if you want to learn more about the cemetery and graves to visit. Many cherry trees have been planted throughout the cemetery, which makes it into a sakura sightseeing spot in spring. The pink flowers contrast nicely with the dark graves, giving a surreal experience. 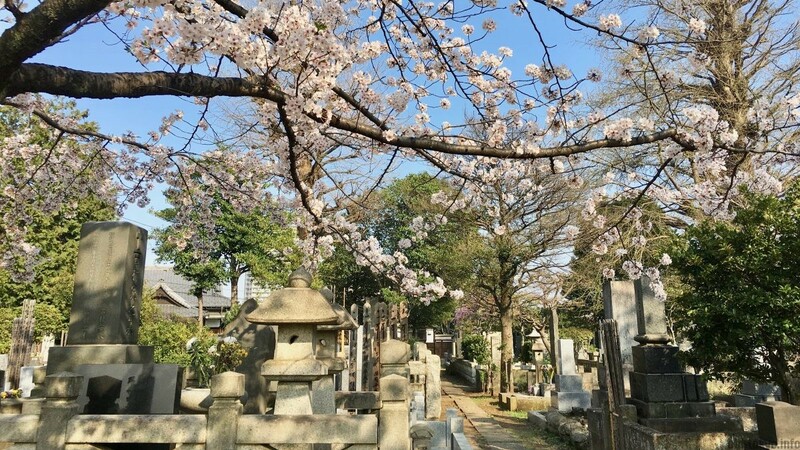 This cemetery is not a traditional sakura spot, but that does not stop people to have a stroll around the graves. Likely due to the nature of this place, visitors are much quieter than at other sakura viewing locations, providing the right conditions for a more serene sakura experience. The graveyard as the backdrop also offers the right metaphor for the deeper meaning of sakura blossoms in Japanese culture. The short-lived sakura blossoms remind us of how also human life is short. They are the embodiment of beauty and mortality. In a way the blossoms urge us to pay attention to the beauty around us. 170 sakura trees are amidst the 7000 graves. 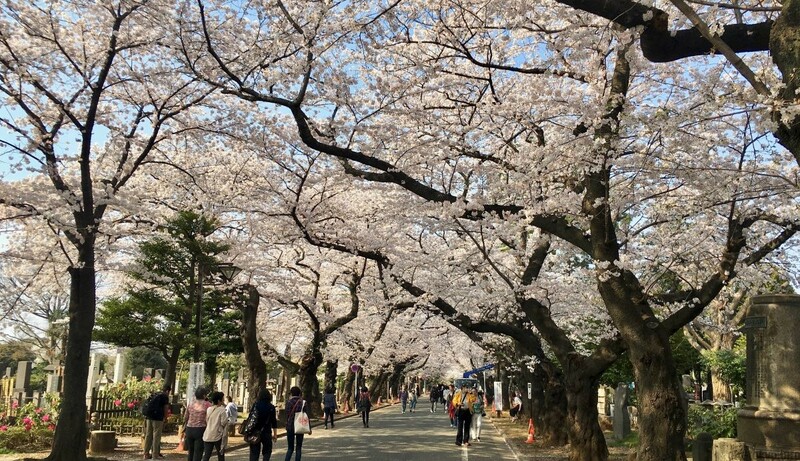 The main road, Sakura-dori (Cherry Blossom Street), cuts through the cemetery and has most of the sakura trees. However, the nicest place to view the trees among the graves is the northern lane. 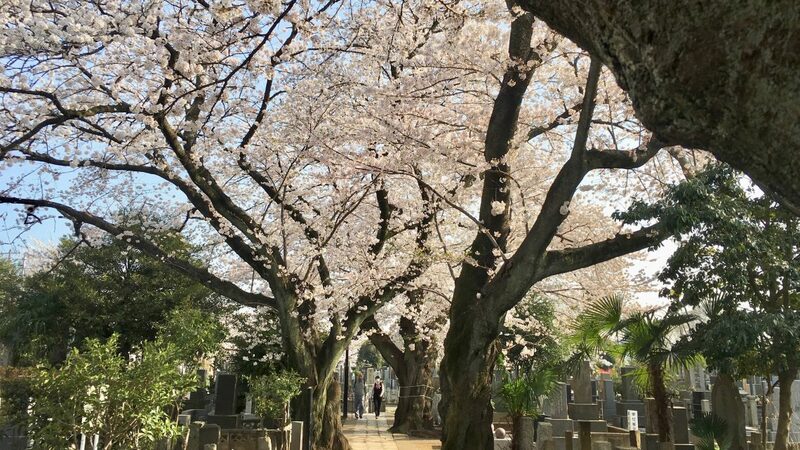 I have added a map at the bottom of this article showing the best locations to view the sakura at the cemetery. Yanaka Cemetery is also famous for its many cats roaming around. Unfortunately, do not expect to see many when you visit during sakura season. Cats are shy and they do not appreciate the increase in visitors. I saw only one from far away, much less in comparison to my previous visits.